Now, we have so many plums we don’t know what to do. Except bake, of course. I have never gone out of my way to make anything with plums, let alone buy them. I think they are a fruit that tends to get overlooked. Or maybe I have just avoided them over the years. When I was a kid, maybe five or so, I was walking down by the lake with my mom and aunt. My mom found a plum tree, picked one, and was so excited about bringing it home. I proceeded to ask if I could see it and then threw it in the lake. I thought it was hilarious…but really I was just the worst. I have brought it up to my mom, who doesn’t seem to remember the whole ordeal. I was probably a little jerk too many times for her to keep track of it all. Now we have a tree, giving us too much fruit, so I guess I’m way overdue to make my mom some muffins. 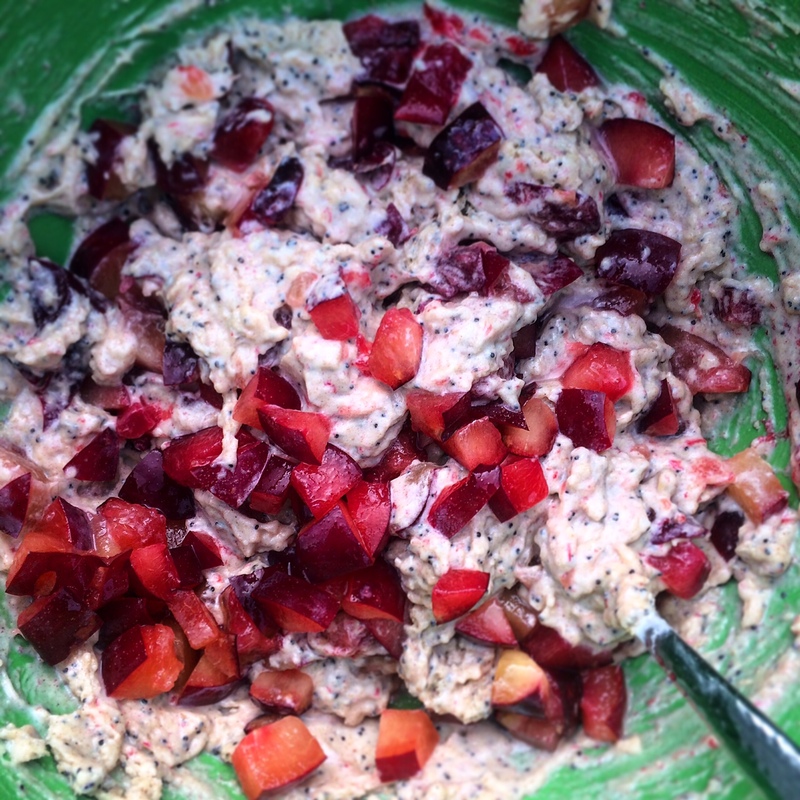 This was the first plum recipe I found in my pile of cookbooks. I knew it was pretty much foolproof since it was from my favorite cookbook which hasn’t failed me yet, and it was easy enough to throw together on short notice. 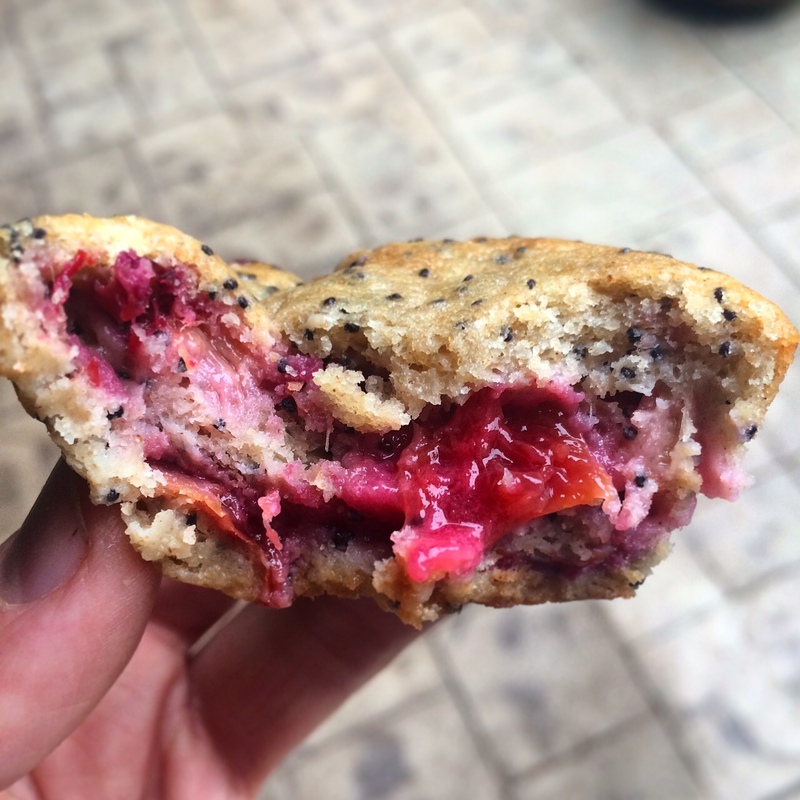 Plus, this is a muffin recipe that can be passed off as healthy. They turned out very moist and “plummy,” if you will, so next time I may add less than 2 cups of plums. 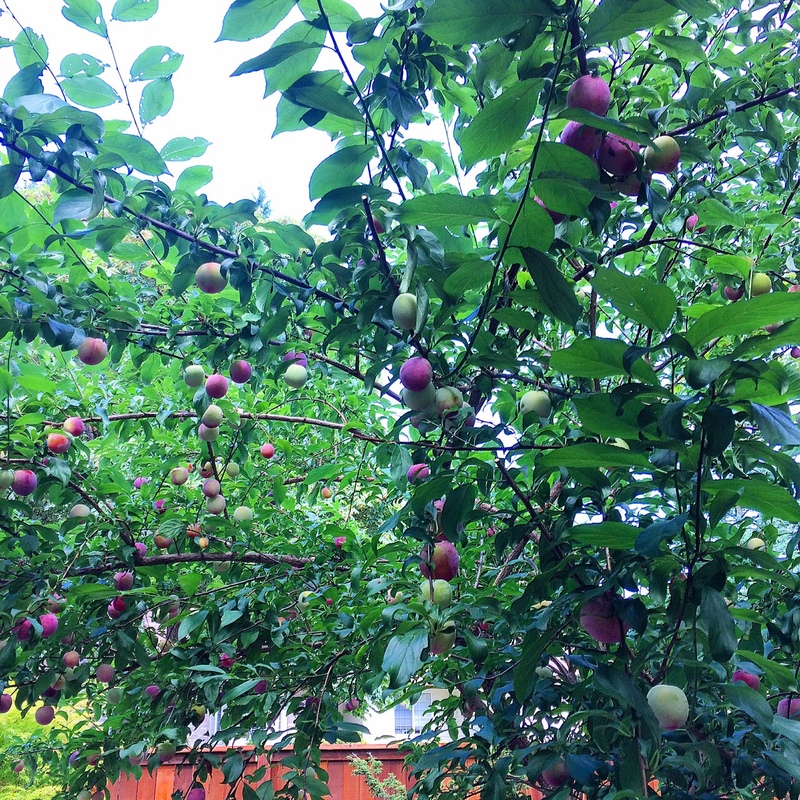 Also – I’m not sure what kind of plums are on our tree. They don’t seem quite as dark as most plums, but maybe they just aren’t ripe enough? They certainly taste perfect off the tree, not too tart and not too sweet. 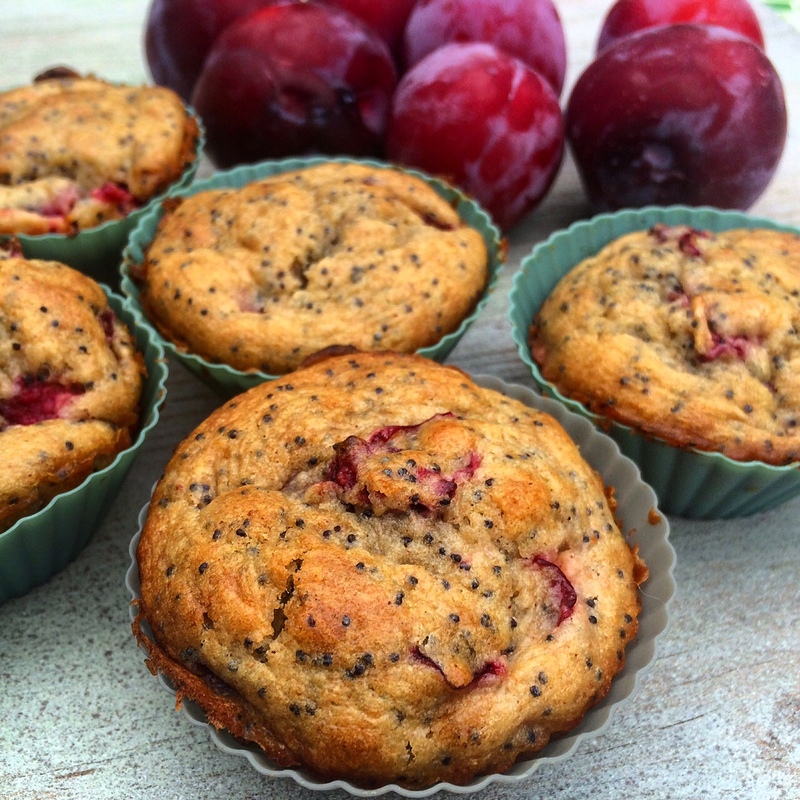 I have discovered tons of other plum recipes to tackle, so be prepared for the rest of the summer to be plum packed! Preheat oven to 375 F. Spray Muffin tin with baking spray or add paper muffin cups (I used reusable silicone muffin cups and sprayed them with baking spray). In a large bowl, whisk the egg with both sugars. Stir in the melted butter, then the sour cream. In a separate bowl, mix together the flours, baking powder, baking soda, salt, cinnamon, nutmeg, and poppy seeds. Add them to the sour-cream mixture until just combined and still a little lumpy. Fold in the plums. Divide batter among prepared muffin cups. 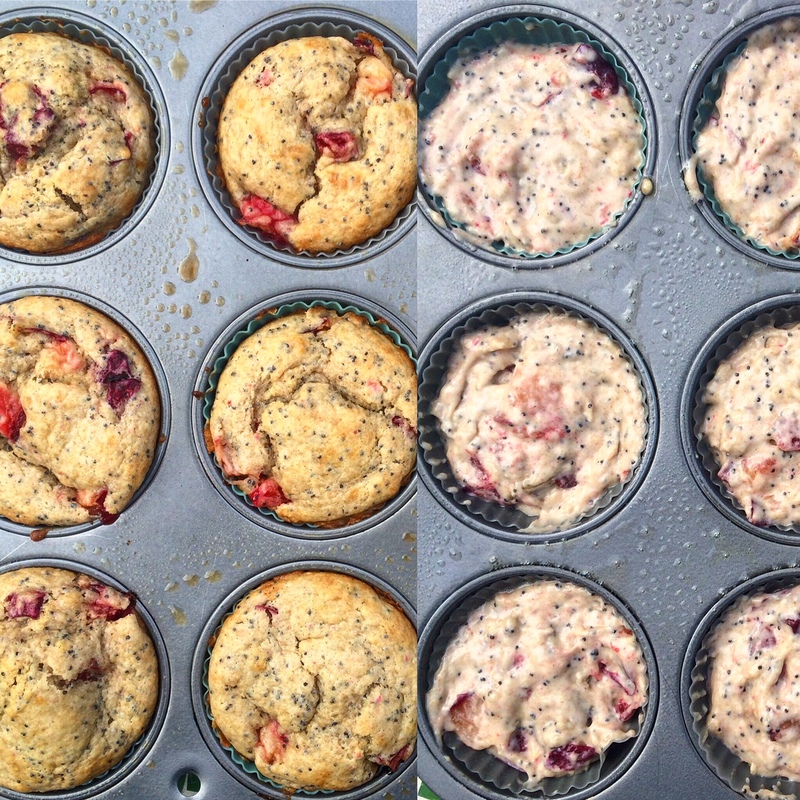 Bake for 20 minutes, until the tops are golden and a tasted inserted in the the center off a muffins comes out clean. 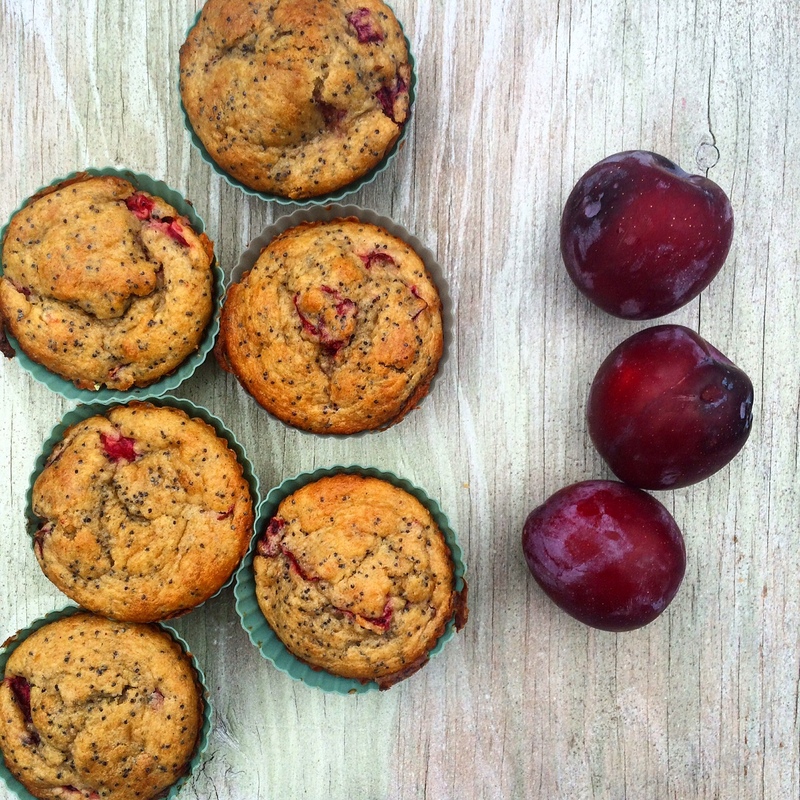 I kept my muffins in a little longer, and they were overflowing with juicy plums. Just keep an eye out for a nice browned muffin top. Rest muffins in the pan on a cooling rack for 5 minutes, then remove from the pan to cool completely.